Star formation in the universe peaked at a redshift of z~2 (when the universe was only ~3 billion years old), and it’s been downhill ever since. This simple observation sparked one of the biggest open questions about galaxies: why did star formation rates start dropping at z~2? What physical processes could shut off (or quench) star formation? To make stars, you need gas—so one way to stop forming stars is to remove the gas from a galaxy. That’s exactly what galactic winds do. Galactic winds are massive outflows of gas and other material that are launched from galaxies. Simulations that include galactic winds agree well with many different observations, suggesting that galactic winds may be responsible for multiple phenomena: not just quenching star formation, but also making star formation inefficient in typical star-forming galaxies, and heating the material around galaxies. However, despite the fact that galactic winds have been directly observed multiple times, we still don’t fully understand how they actually work. We do think that feedback (the injection of energy and momentum into the interstellar medium) from supernovae probably plays a role. Today’s papers (yes, today you get two paper summaries for the price of one!) aim to study this in more detail. Both papers are by the same authors, who examine two different ways to simulate supernova feedback. Unfortunately, it’s computationally expensive to simulate an entire galaxy with resolution on the scale of individual supernovae. To get around this, nearly all previous simulations of supernova feedback have looked at local computations—that is, simulations of relatively small volumes within a galaxy (see Figure 1). Today’s first paper presents some of these local computations. 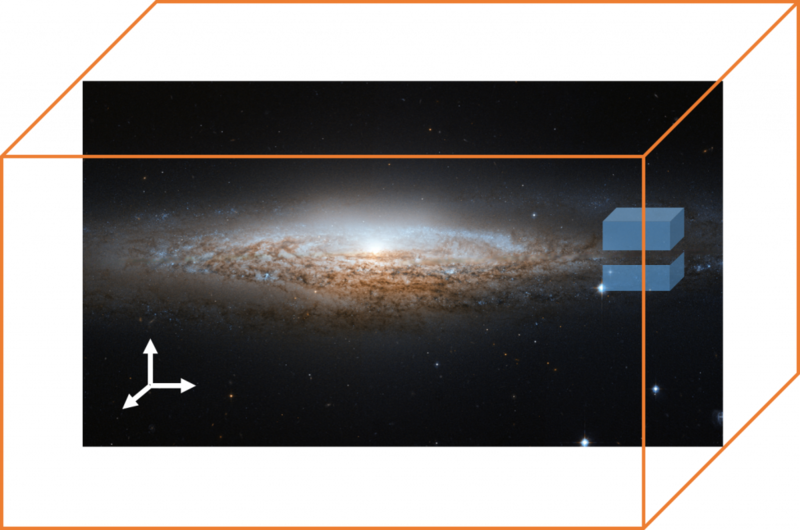 The authors run hydrodynamic simulations of a box with length ~1 kiloparsec, which they model as part of a galactic disk (the blue box in Figure 1). Supernovae are seeded at different places throughout the box, and each supernova inputs some energy and momentum into the box. The vast majority of this energy either radiates away or produces turbulence in the galaxy’s interstellar medium. Only some (at most 10%) of the energy from supernovae actually helps power galactic winds, and this just isn’t enough to launch galactic winds that are as energetic as we’d expect. Other local simulations found the same result (for instance, check out this Astrobite, which also looks at other processes that can cause galactic winds). This suggests that supernovae by themselves might not produce galactic winds in the real world. But maybe this isn’t the whole story. The authors of this paper also decide to play with the geometry of their simulation. As Figure 2 shows, when they increase the height of their simulated box (solid lines denote a smaller box, dashed lines denote a larger box), the outflow rate of the wind also changes. In other words, the output of a local simulation depends on its geometry! Figure 2. Plot of the “wind mass loading factor” (which is proportional to the outflow rate) as a function of time. The solid lines show measurements in the original box of side length 1 kpc, while the dashed lines show the same measurements in a box of side length 2 kpc. The colors denote the heights at which measurements were taken: blue is closest to the disk, purple is farther from the disk, black is farthest from the disk. Figure 9 from Paper 1. This brings us to today’s second paper, in which the authors try to avoid the limitations of local simulations by studying supernova feedback in a global context. They simulate entire galactic disks (orange box in Figure 1)—although they’re limited to relatively small disks, since they still have to resolve the individual supernovae that are seeded throughout the simulation volume. These simulations are fairly simple and don’t include other physical processes that could be important, like galaxy rotation or magnetic fields. 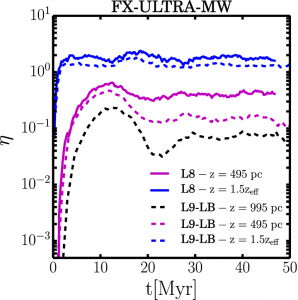 But even these preliminary results agree well with analytical expectations, implying that supernovae might play a larger role in producing galaxy winds than local simulations suggest! Today’s papers reflect an inconvenient truth about simulations: you get out what you put in—and because of limited computing power, you just can’t put in everything. So you have trade-offs between spatial size, resolution, and the amount of physics in your simulation. It’s important to understand what trade-offs you’re making, and how they affect the scientific question you’re trying to answer. With advancements in computing power, some of these trade-offs are slowly being eliminated. Today’s Astrobite, for example, illustrated a shift from local to global simulations that’s been occurring in multiple areas of computational astrophysics. These simulations still aren’t perfect, but they’re getting better at giving us insight into astrophysical phenomena on all scales.